A few weeks ago I spotted something new to me the wine store. A liquor called "Root," based off an early Pennsylvanian spirit called "Root Tea" created by Native Americans. Using birch bark and a whole range of foraged roots and herbs, they passed this drink to early settlers, who made it even more potent. During the temperance movement, a Philadelphia pharmacist removed the alcohol and made the soft drink root beer we know and love today. As the spirited distillate faded into history, it was revived by a company called Art in the Age of Mechanical Reproduction, who has contracted to have it distilled by the people behind Hendrick's Gin (uniquely flavored with rose petals) and Sailor Jerry's Spiced Rum. I used to drink a lot of root beer as a kid. It seemed so much more interesting than the carbolic flavor of Coke or Pepsi. Nowadays I rarely order it, except as a root beer float. This love of root beer came to me honestly; when my Dad was a child, he would sneak to the basement at night with his father to drink the root beer they had made. So on Friday I decided to pick up a bottle and try it out. Opening the bottle gave way to a rush of the most perfect root beer aroma, followed by just a light trace of alcohol. Initially sipped over ice, this liquor tasted a lot like jagermeister...which I wasn't sure was a good thing. As the ice began to melt, however, the flavors really opened up. The anise, spearmint, and clove all come at the forefront, backed by the citrus of the lemon and orange peel. The finish is lightly minty, rounded out by the woodsy flavor of the birch and smoked black tea. 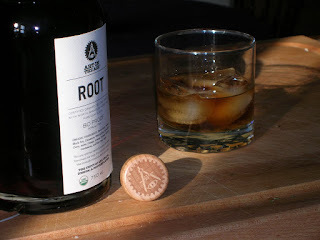 Reading up online, I found this fun video by the Root distillers about the history of the drink: http://www.artintheage.com/spirits-aita/ One interesting thing they did is to make sure all their ingredients were certified organic, since in pioneering times almost everything was harvested wild. I'd be curious to try this with ginger beer, as that seems to be a natural partner for Root's bouquet of aromatics. Art in the Age also recommends hard cider--something I've got quite a lot of laid aside. It's an enjoyable tasting spirit, it just needs something to thin out the density of flavors all kicking around inside. I love your blog as I have always been curious (and scared) of cheese making. I fantasize that I will get some goats and make cheese when I retire. So it is with great pleasure that I live vicariously through your cheese endeavors . I see you are following my blog and I am flattered! Thanks very much! Although I'm still getting my bearings in the cheese making world, it's been a delicious journey. Oh, and your rosemary-rhubarb preserve recipe was a lifesaver earlier this spring when I was inundated with rhubarb! You are right, the Art In The Age video is fun and interesting to watch. Yours is an amazing website, filled with learning, humor and great perspective on all things related to food. And the homemade cheese press is fascinating.